It was the best of habits, it was the worst of habits, it was the act of wisdom, it was the act of foolishness. Ahem. Pardon me, my Victorian-ism is showing. In plain English, I have a problem. It's a good problem, but a problem nonetheless. I've been reading more lately (that's the good part, obviously), but I've been reading primarily the same thing: young adult novels. That's the slightly problematic bit. Now why is this a problem at all? I could, after all, write volumes of blog posts about my favorite young adult books and why I adore so many titles in that genre. The trouble is, too much of a good thing, even as good and addicting a thing as young adult fiction, can be... well, too much. Here are twelve reasons I'm endeavoring to read more classics, and perhaps you ought to as well! 1. Classics are enduring. This is arguably one of the biggest reasons for a book to even be considered a classic. These books have stood the test of time and remained strong. No matter how many decades pass, these stories still resonate with us as much as when they were first written. We still relate to the characters, empathize with their predicaments, and learn from their failings. Classics never become outdated, because they accurately capture the human condition- something that is uniquely timeless. 2. Following reason #1, much of our modern entertainment is inspired by these old time tales. I once had a conversation with another English major about how many of Shakespeare's themes are woven into modern stories, from young adult books to television series. Even the Lion King can hearken back to the Bard, and I'm convinced that Thor does, too. And that's just Shakespeare. Think of all the modernized adaptations Jane Austen's books have inspired. There are A LOT. 3. Perhaps this isn't true for every classic, since some of them are famous for their gritty, unpolished realism. In many cases, however, classics are eloquent. The common language of centuries past was far more elegant than our common speech today. Even the awkward people could be articulate in their own way! (I'm looking at you, Mr. Darcy.) Reading the witty turns of phrase, majestic descriptions, proper conversations... It makes me appreciate the depth of language, and how vast a vocabulary exists. It also makes me feel smarter and more cultured. 4. You can read them again and again. Since most of us know the plot lines of literature's great works, it's a good thing spoilers don't tarnish the experience of classics. Even if you know the ending from Spark Notes, a classroom discussion, or a previous reading, classics still provide an engaging, vivid experience. There is so much depth and detail, that you could read a classic over and over, and still appreciate it on a new level. 5. They make great book recommendations. It's one thing to tell a friend to read a book that's already on the New York Times bestseller list. It's another to recommend a book that has survived and thrived for decades. Sharing a classic is not only sharing a story, it's sharing history and a treasured experience. Most recently, I was recommended Jane Eyre and the Great Gatsby. Both have been on my shelf for a while, but now that I've heard from a few friends how amazing they really are, I can't wait to experience these two classics. A quick word of advice: As with all books, not everyone will appreciate the classics you recommend. It's okay. They'll come around to it. Pride & Prejudice is awesome, and that is all. Any opinion otherwise is invalid. 6. They actually do make you smarter and more cultured. Reading is generally regarded as leisure, but it can also be educational. Classics bring a wealth of knowledge, from vocabulary to history to humanity. They teach us about times gone by, and challenge us on issues that still exist today. 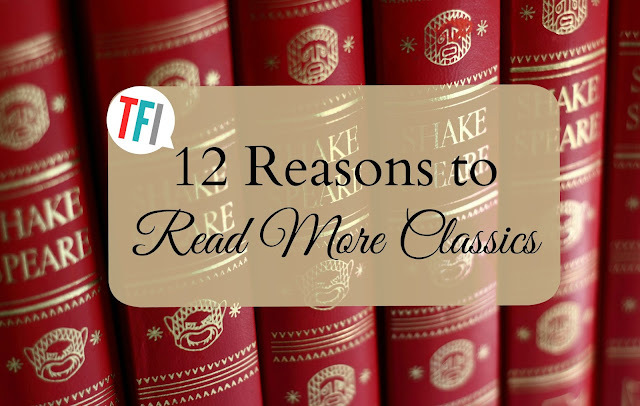 Because so many of them helped shape societies, classics also can help shape our character. 7. Some of the most memorable fictional characters live on the pages of classics. Mr. Darcy, Oliver Twist, Jane Eyre (so I'm told), Scout Finch, Sherlock Holmes, Bilbo Baggins... The most enduring characters, and often the most fan-worthy, aren't all in this summer's hottest releases. They're in books of ages past, and they're still every bit as awesome as when they were written. 8. It is possible to fangirl over classic literature. The old-fashioned language may give it a snooty, dry feel at first, but once you get into the story, there's a lot to fangirl over. Take those characters we mentioned on #7. I defy any girl to read Jane Austen's books and not find a gentleman to fangirl over. 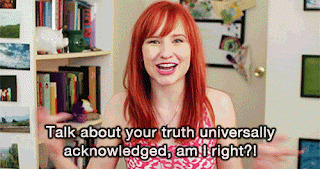 ;) Bonus points: this is fangirling that can be productive, since you can even major in literature! 9. Classics can span genres. They are romantic, adventurous, coming-of-age... There are so many categories you can find classics to fit! Even if old literature isn't your usual forte, you can find one that suits your tastes in reading. 11. Many of them also have excellent film counterparts. Even though the book still tends to triumph over the movie, classics make fantastic movies. BBC is especially good at adapting them. 12. Classics really aren't scary. They're books, just like that awesome new YA release. True, they're often heavier, longer reads, and you may have to decipher bits of them. But they are books, and books are meant to be read. No matter when they were published. What are your favorite classics? Which one will be your next read? Sarah, I love this post. I love your gif use. Spot on. I can't pick my favorite. The reasons to read are definitely spot on. Thank you, thank you. I haven't delved too much into classics, but I will say that I do have a heart for Jane Eyre. She was so relatable, and I just enjoyed her story on many levels. :) I need to give classics more of a chance than I have been, so here is to reading more classics soon! AAAAGH! YEESSS! I must admit, I am a classic literature fangirl. There is a reason why those works have been so popular and respected for ages. They have a special quality, a way of immersing you in another world, that is just unbeatable. You used that gif from North and South! *fangirls* Mr Thornton!